This Pecos County Ranch is a super property located just north of Ft. Stockton on FM 1053. This 2006+ acre ranch is only an hour from Midland, Texas making it extremely convenient with easy access. This ranch is both fenced and cross-fenced, with the perimeter fence being in really good condition. There is a very good solar H20 well on the ranch that is piped to a few different watering tank locations and streaming hydration to the livestock and wildlife. This 2006+ acre ranch is neighbored and outlined by larger ranches, which provide great refuge and protection for this particular property. The bluffs and ridges across the ranch provide various excellent views, really good vantage points, and great elevation change. In addition, there are big brushy draws that run completely through the ranch providing additional valuable coverage and furnishing a corridor for the native wildlife. The ranch has been leased for grazing only by a neighbor ranch; however, the situation has not been taken advantage of nor has this property been overgrazed. This ranch is mostly covered in mesquite and tobosa; although, there are a few varieties of gama grasses, cacti, greasewood, buffalo grass, and sacatone located in the draws. This ranch has some excellent mule deer and is located in “Quail Country.” In addition to being an excellent recreational ranch, there is an opportunity for land investment with the upside being on land appreciation. The Pecos County Ranch is very clean and has some terrific potential. 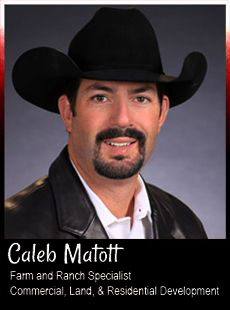 Contact Caleb Matott today to discuss this great opportunity.